Hosting a show in September can be a gamble here in Calgary. With snow causing issues in the city not long before, we were concerned that the annual Quarry Park and Polish Show could be affected but fortunately the weather cooperated and the day of was clear and dry. It was a bit chilly at times if I were to nitpick but we were happy to see the roads dry up and sun come out! I have been attending Park and Polish for a handful of years now and always look forward to it. It’s typically the last big event I attend each season and just like I consider the Spring Thaw to be the start of the ‘show’ season here in town, I consider Park and Polish to be the end. Of course we continue to attend meets and hang out afterwards but this is typically the last time we really clean up the cars and prepare for a real show and shine. After this we take a more relaxed approach to the meets as we also prepare for winter mode. I decided to save part 1 of the coverage for our cars and some commentary on the show, while part 2 will look at the rest of the vehicles on display. Quarry Park is a beautiful place for a show and provides some nice backdrops for photos. The layout of the parking lot also allows for a good way to organize different classes of cars, having each in its own area. The cars get split up into three groups to try to keep similar vehicles together. 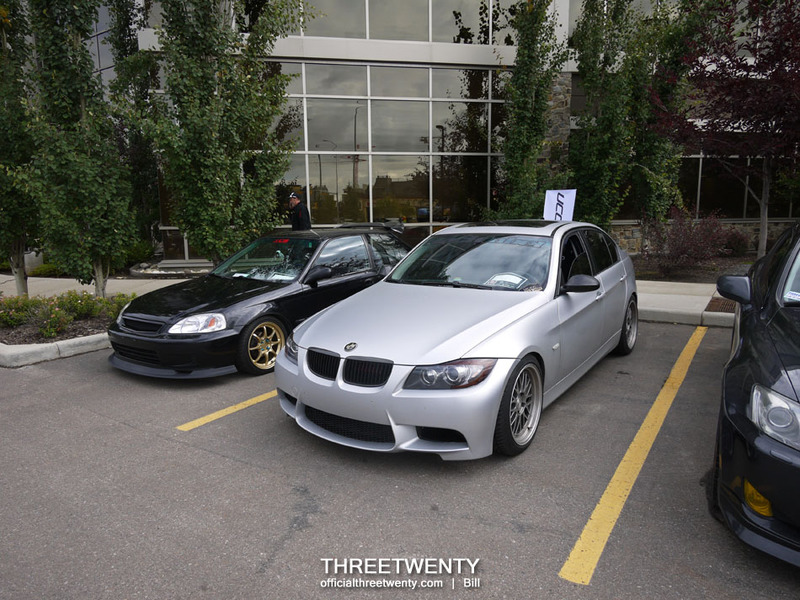 As always we were part of the tuner group and our cars wound up along the outer edge within that section. Another show means another commemorative decal! I made up these tri-coloured decals for everyone, opting to go for a Falken-inspired colour scheme (aqua and blue) with a white background so the letters would be clearly visible. I try to change up the design and colour scheme for each show and everyone seems to like them. If nothing else, they’re a nice souvenir and it’s great to be able to surprise everyone with something as a thank-you for being part of the group. 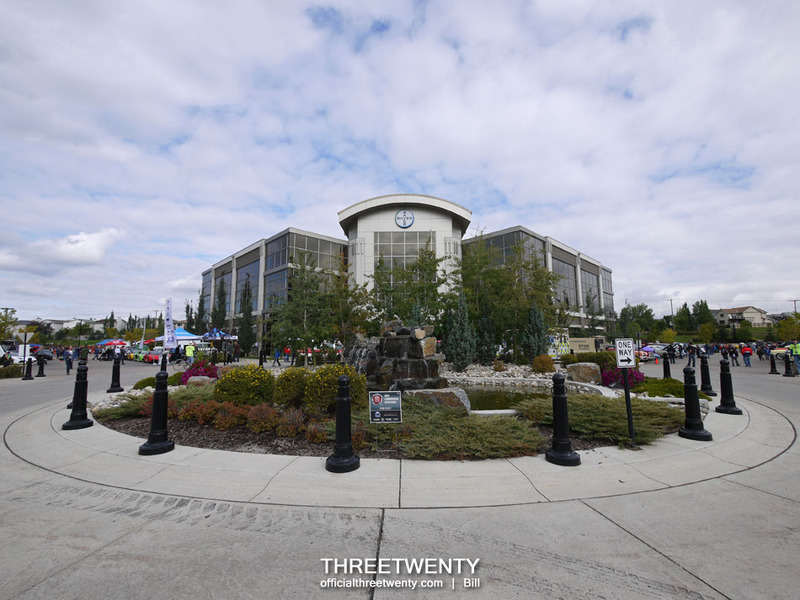 This time we went as ThreeTwenty and the UCCarClub. Andrew joined us with his Mk1. I believe ours were the only Foci at the show that day. Just recently he fitted coilovers so his hatch is a little lower now than it was here. Still rocking the blue tape! I’ll eventually fix the splitter. The Tarmacs were also still on as the Rays hadn’t arrived yet. I do like them of course but part of me misses the look of white wheels on the car. Normally Solomon and Terence would both represent the European cars, but you may notice a slight difference this year. More on that in a second. 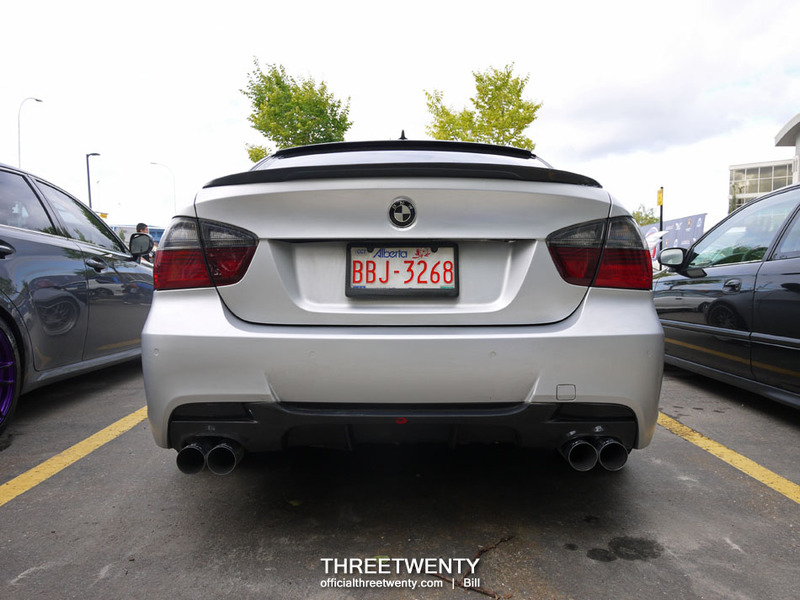 Right after this second shot of the E90. This time Terence brought out his new project, a black ’99 Civic hatch. While he was known for his C Coupe, he had long been wanting a 96-00 Civic and not too long ago found this clean example which he picked up from the original owner. Already it has some really nice parts and from what I have learned of his plans, it will be changing for a while yet. Some day I hope to follow his lead and finally pick up a DC2 for myself. Since we were representing the UCCC we were flying the banner for our sponsor Petro-Canada. I think perhaps we need to up the size of the actual UCCC banner now…. 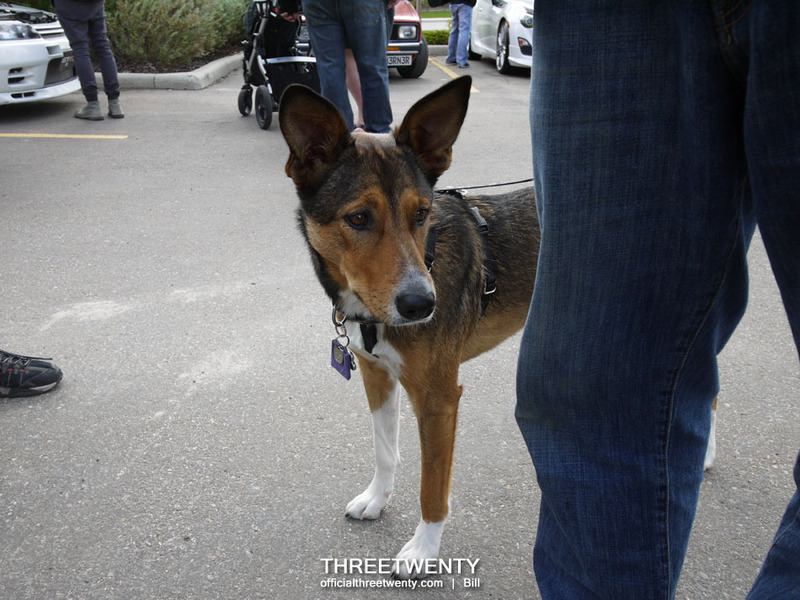 Dogs are almost a given at any car show and we saw a few wandering around with their owners. This is Penny, Yolanda’s dog. Once again there were some awards that were to be handed out at the end of the day. Unlike other shows where categories are usually based on make, model, region, or so on, these are more for fun you could say and some of the categories are rather unique. Here we have (left to right) ‘Best Classic’, ‘Ticket Magnet’, and ‘Car We Wish We Had’. 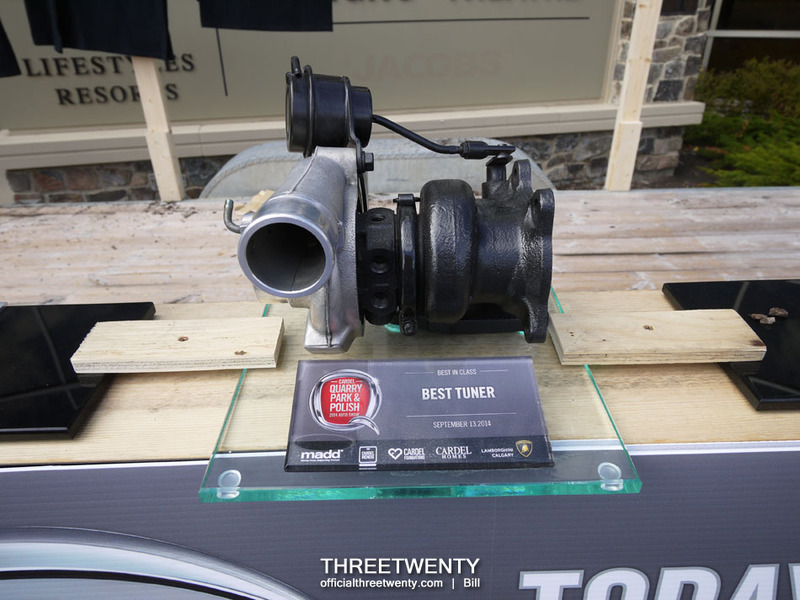 The odd one out was a turbo for ‘Best Tuner’. 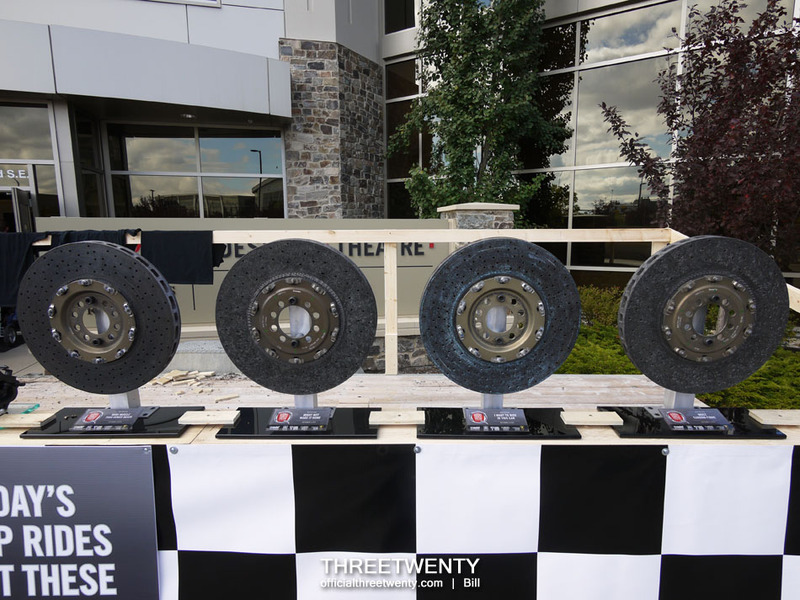 The rest of the rotors were awarded to the winners of ‘More Muscle than Venice Beach’, ‘Might Not Make it Home’, ‘I Want to Ride in This Car’, and ‘Most Carbon Fiber’. 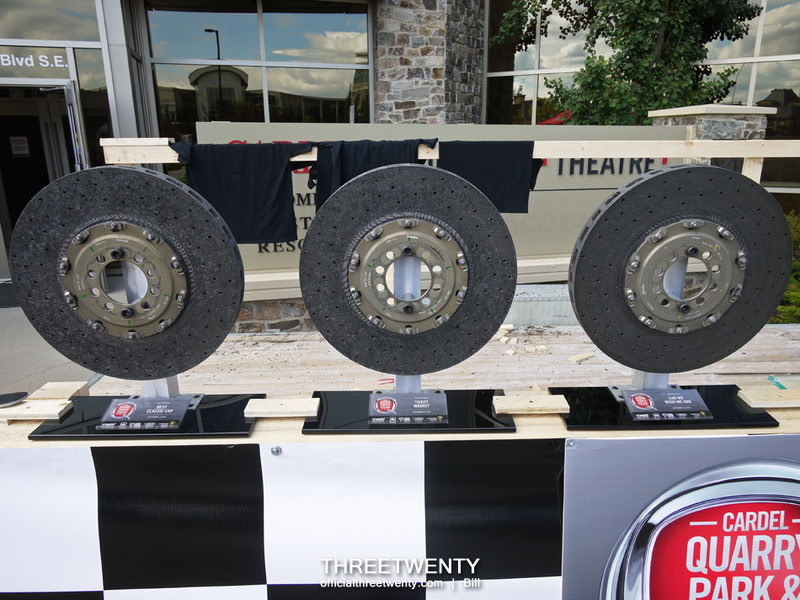 Making trophies out of used brake rotors may sound odd on paper but they always look really cool. Along with announcing the award winners, it was also shared that a total of $30,000 was raised during the day which is phenomenal! Knowing that all of this is to support a good cause (MADD) makes the day even better. Once the show had wrapped up and the lot was clear, a few of us came back for a few photos since it’s such a nice location. Solomon’s E90 was the subject of a number of them, for an upcoming highlight. One special treat at the show was this demo Huracan that was on display. It was the first one in Canada and was being used to show off the new model. Within that grey bodywork was a black and orange interior which looked amazing and seeing one in real life was truly a treat. It was still around afterwards so we didn’t pass up the chance for a photo with a couple of the cars next to it. That’s all for today, so be on the lookout for part 2! Previous Post Previous post: Site News: SE Emblem Update, and Key Chains!